A ‘Vision for Black Lives’ centers and amplifies the voices of Black food justice organizers from across the country. Chanowk Yisrael, a Black farmer in Sacramento, California, never had an interest in advocacy work or engaging extensively with government entities—until recently. Yisrael, who started Yisrael Family Urban Farm with his wife Judith in 2008, says he decided to get involved when he encountered regressive city laws that didn’t allow him to sell the food he raised. “I realized there were policies in place that handicapped us as urban farmers,” he says. Since then, with the Sacramento Urban Agriculture Coalition (SUAC), Yisrael has worked to change the law, making it possible for him to bring his produce to market. But he says there is still a long way to go to improving food production, accessibility, and affordability in the area. Although it’s considered the “fruit basket of the nation,” almost four out of 10 low-income households in the Sacramento area are food-insecure. And Black and Latino households are at a considerably higher risk of experiencing hunger and food insecurity. Furthermore, Yisrael and others believe that “food apartheid” keeps impoverished communities from fresh, healthy, affordable food. According to SUAC coordinator Katie Valenzula Garcia, the people working in the field of food advocacy are too often coming at the work from an outsider perspective, and they “aren’t living in communities with high rates of food insecurity” themselves. This disconnect often dramatically reduces the effectiveness of the policy and programmatic interventions. Yisrael believes that top-down advocacy commonly prescribed to communities of color is driven by a potential fear of losing the relevancy, power, and resources that have traditionally been held by white people. Both Yisrael and Garcia say there’s a need for Black self-determination locally and nationally within our food systems. This sentiment is why the six-part policy platform recently published by the Movement for Black Lives (M4BL), a national collective of over 60 Black-led organizations including the Black Lives Matter network, is being heralded as both timely and necessary. A “Vision for Black Lives” centers and amplifies the voices of Black food justice organizers from across the country. And, in addition to improving economic justice, giving more power to communities, and repairing the damage done by slavery, the platform recommends radically different policy solutions to long-standing inequities within our food system. “[The policy platform is] rooted in the brilliance that if we just divest from all the things that are destroying our communities—divest from harmful prisons, divest from mass incarceration, divest from fossil fuels, divest from our horrendous military budget—we’ll free up resources to do the things we know need to be done, like making sure our people are safe, healthy, and educated,” says Dara Cooper, a national organizer for the National Black Food and Justice Alliance and another member of the M4BL policy team. A constitutional right to a fully-funded PreK-12 education, which would include the right to high quality breakfast and lunch for all Black children. Tuition- and fee-free agricultural education at colleges and universities for all Black students. An end to mass incarceration and the privatization of prison labor and services, including farmwork and food services. Divestment from industrial agriculture that relies on fossil fuel, agricultural chemicals, a resource-heavy transportation system as well as a shift toward local, sustainable energy sources and systems. A shift toward decentralized, community-controlled food hubs and cooperative organizations. A right to restored land, clean air, clean water, and housing. A halt to all foreclosures of Black farmland and the elimination of all Black farmer debt. An end to discriminatory credit policies by financial institutions in order to enable access to farmable land. Guaranteeing access to public funding for community land trusts, food co-ops, and food hubs for Black people. Full protections for workers in industries that are not appropriately regulated such as farm workers, including those who are incarcerated. Universal basic income that would not be tied to employment as an alternative to public health and nutrition assistance programs like Supplemental Nutrition Assistance Program (SNAP) and the Women, Infants, and Children program (WIC). Reparations for the wealth extracted from Black communities through food apartheid, environmental racism, and racialized capitalism to ensure access and control of land and food sources. Current food systems and policies are not always explicitly discussed in the policy platform, which Cooper says is intentional. “[In the policy platform,] we talk about affordability and accessibility [of food in] a different way and envision a radically different system,” she adds. According to the M4BL policy team, the current food system, and in particular industrial agriculture, is “unsustainable, profit-driven, and exploitative of labor, the environment, land, water, etc.” Therefore, the M4BL vision is not focused on reform, but imagining a seismic shift in how and by whom food is grown and distributed with the focal point being communities instead of multinational corporations. “As long as agribusiness and food-for-profit dominate, Black people and billions in the world will remain food insecure, hungry, malnourished, and even die of starvation,” says Rose Brewer, professor of African American and African Studies at the University of Minnesota and another member of the M4BL policy team. In their policy platform, the M4BL makes a point to challenge language traditionally used to describe inequities, such as “food deserts,” which the team believes is a misnomer. They contend that what Black communities are actually facing is “food apartheid,” due to redlining by government regulations and the practices of major corporate grocers similar to what was seen in the housing industry. 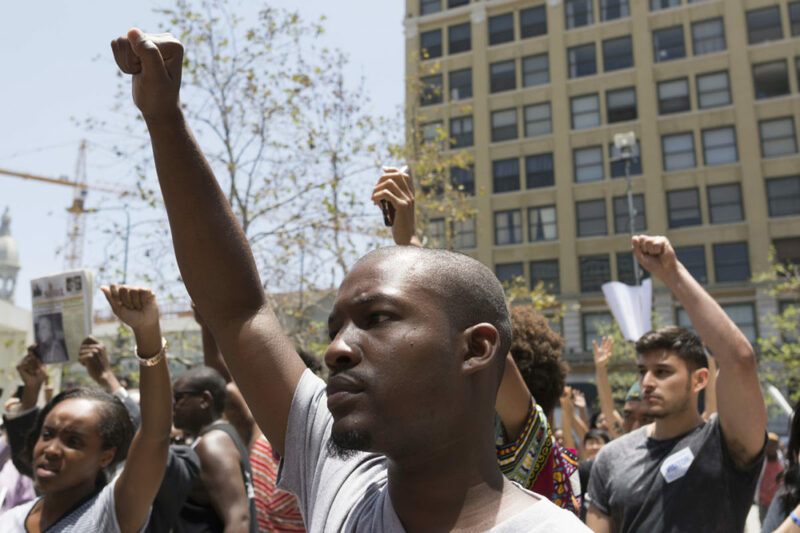 The Movement for Black Lives recognizes that not all of their collective needs and visions can be translated into policy; they see policy change as one of many tactics necessary to move Black communities towards the world they envision. Photos, from top: Black lives matter protestors march on City Hall following ruling on LAPD fatal shooting of Redel Jones; Black farmers and food justice activists at the Detroit Black Urban Growers Conference.